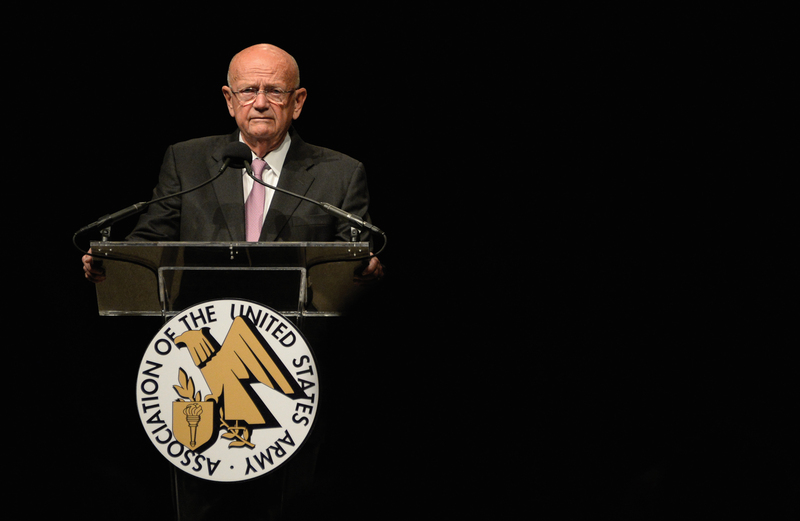 As he prepares to step down June 30 as president and CEO of the Association of the U.S. Army, retired Army Gen. Gordon R. Sullivan is deeply concerned about the future. Not his, but the Army’s. Sullivan spent more than 36 years in the Army, rising to become the 32nd Army chief of staff. He then spent more than 18 years heading AUSA, an educational nonprofit dedicated to being a voice for the Army and its soldiers. Retired Army Gen. Carter F. Ham is Sullivan’s successor at AUSA. Sullivan speaks with experience when he expresses trepidation about the Army’s future. When he was chief at the end of the Cold War, he was ordered to oversee what amounted to a 40 percent reduction over four years in the Total Army. He did this while attempting to maintain morale and a sense of purpose while also seeing the Army deploy on unexpected contingencies to Somalia, Rwanda, Haiti and the Balkans; and also with Hurricane Andrew, then the most destructive hurricane in U.S. history. One of his goals throughout that process in the 1990s was to prevent the Army from losing combat prowess by turning to technology, tactics and training to keep soldiers sharp. ‘We may be living a tragedy,’ says retired Gen. Gordon R. Sullivan, who is stepping down as president and CEO of the Association of the U.S. Army. Sullivan also believes current Army leaders are facing today’s challenges as well as can be expected, but he worries about putting too much strain on the force. “The real challenge is to hold it together spiritually,” Sullivan said. “People get to choose how they live their life. This is how I wanted to live my life, as a soldier,” Sullivan said. Leaving doesn’t mean sitting still, however. Sullivan is the chief organizer of an AUSA-sponsored initiative called Guiding Principles for the 21st Century. The idea is to create a bipartisan framework for U.S. domestic and foreign policy, similar to what the 1941 Atlantic Charter did in crafting foreign policy objectives for the U.S. and Great Britain and ultimately, for the other nations that signed onto the principles. The goal is to create a list of about eight policy goals that would strengthen the U.S. role as a global leader and shape the future. They include respecting national sovereignty, supporting the right of people to choose their own form of government, and supporting human rights. A working draft addresses support for peaceful resolution of international disputes; and international cooperation to reduce crime, corruption, terrorism, genocide, famine and pestilence. The hope is to have approved guiding principles available for review this summer, in time to be shared during the presidential elections. Sgt. 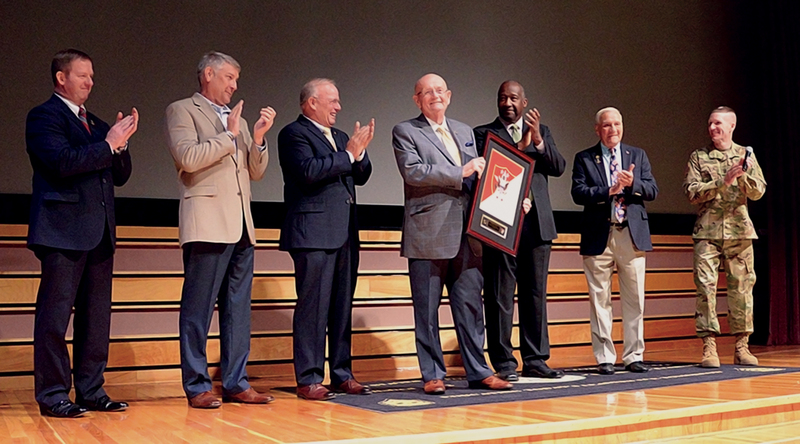 Maj. of the Army Daniel A. Dailey, right, and five former sergeants major of the Army congratulate retired Gen. Gordon R. Sullivan after he was named the first honorary sergeant major of the Army. During his many decades of service both in Army uniform and as president and CEO of the Association of the U.S. Army, retired Gen. Gordon R. Sullivan has met and spoken to a countless number of soldiers. Some stand out in his mind more than others. As Sullivan prepares to retire from AUSA, he talked about two soldiers who made indelible impressions on him. One is former Sgt. Christopher Reid, whom Sullivan met in late 1993 at Fort Drum, N.Y. Reid’s unit in the 10th Mountain Division was being welcomed home from Mogadishu, Somalia, just a couple of months after helping to rescue other U.S. troops following a helicopter crash in the city. It was Reid, a fire team leader who had been severely wounded in Somalia when a rocket-propelled grenade blew off his right hand and shredded his right leg. He told Sullivan he was compelled to come to the ceremony to stand “one last time” with the men he fought with. Another soldier who made an impression on Sullivan also was wounded in Mogadishu. He was an “E-4 named Ly, a Vietnamese kid, weighed about 98 pounds soaking wet,” Sullivan said. They met in October 1993 when U.S. troops wounded in Somalia were returning home through Andrews Air Force Base, Md. 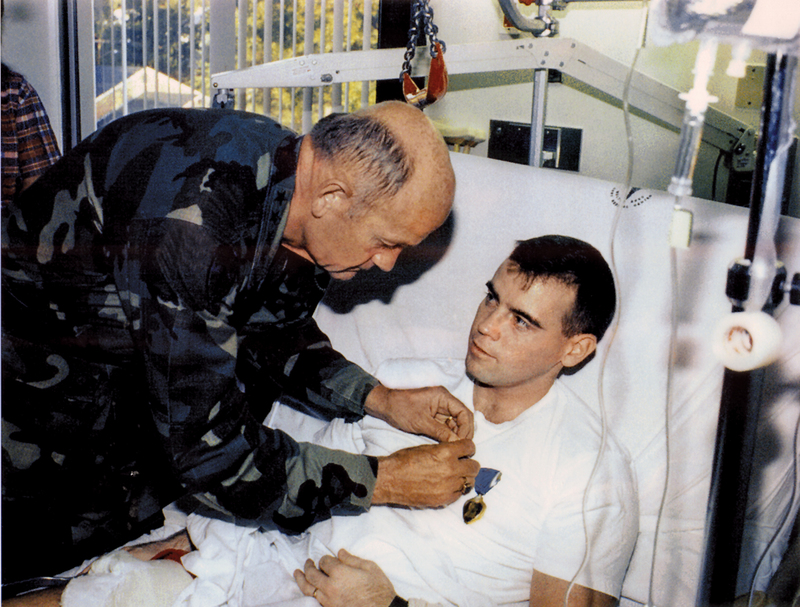 Then-Army Chief of Staff Gordon R. Sullivan visits an injured soldier in the early 1990s. The big jump in his career came after his second tour in Vietnam, with consecutive assignments as G-3 for VII Corps under one of his mentors, Lt. Gen. Julius W. Becton Jr., and later as a brigade commander at Fort Riley, Kan.
*Senior Staff Writer Chuck Vinch contributed to this article.